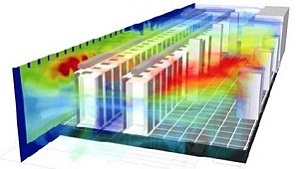 A February 22 article in the Data Center Knowledge emag published more information regarding the third revision of the ASHRAE “Thermal Guidelines for Data Processing Environments”. According to the Data Center Knowledge article the expanded ranges for operating temperatures and humidities may be a way for ASHRAE to catch up with the recommendations of the major players in the IT industry. Google, Intel, Microsoft, and HP are all quoted as praising the higher operating ranges. The new ASHRAE guidelines define four classes of operating environment with classes 3 and 4 recommended to use outside air only for cooling. Class 1 and 2 are defined as typical data center server environments, although Mr. Belady’s comments might suggest that the big data center players have moved past this already. o class 4 is now 104 degrees F.
In previous blogs we have noted that data centers are becoming prime applications for evaporative cooling in many parts of the world as data center operators struggle to reduce energy costs. These new guidelines make evaporative cooling a viable HVAC solution for even more data and IT applications. Indirect evaporative cooling systems such as the Aztec ASC line can easily provide temperatures to satisfy even class 1 conditions in many climates.